We study the biological mechanisms underlying cognition and brain disorders from a network perspective. Brain networks span from the micro-scale of neurons and synapses to the macro-scale of long range connections between brain regions. We investigate how networks connect levels of organization in the brain and how they link structure to function. We also investigate pathophysiology and try to find treatment modalities of diseases that give perturbation to cognitive functions such as Alzheimer’s disease. For these purposes, we mainly use in vivo imaging modalities such as two-photon microscopy, near-infrared fluorescence imaging, EEG and MRI. Images are obtained from human subjects and animal models to investigate how the integrative nature of brain function can be illuminated from a micro-level network to a large scale network. Through this we want to understand the higher cognitive functions of human brain (how the brain works) and to develop restoration, augmentation and modulation systems for patients with brain dysfunctions using current cutting-edge bioengineering techniques. cognitive function and establish a network model of cortical functions. Our research is undergoing to better analyze the brain mapping data and network analysis using graph theory. 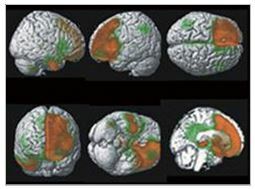 The application of graph theory principles to neuroimaging data offers a powerful approach with which to characterize and quantify the large-scale structural and functional networks of the brain, thereby enabling assessment of both the efficiency of information transfer between different brain regions and the implications of widespread damage or local damage to specific anatomic regions. Patients with brain damage or degeneration can provide us invaluable cognitive function model. With deep collaboration with major university hospitals, we are performing clinical studies on patients with neurological disorders. We are trying to characterize the neurological diseases such as Alzheimer’s disease, Parkinson’s disease, frontotemporal dementia and stroke using neuroimaging techniques and to find candidate biomarkers. In addition, to understand the mechanism of hemispatial neglect and visuomotor control system. 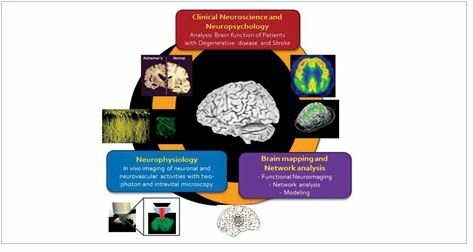 Our methods are equally diverse; including neuroimaging, behavioral and neuropsychological testing, transcranial magnetic stimulation, event-related potentials, eye tracking, motion tracking, and computational modeling. With a certain cognitive process, clusters of neurons activate together and form neural circuit that is thought be a substrate of such process. In addition, neuronal activities always follow changes of vascular activity that increase the blood flow of those regions of the brain, the neurovascular coupling. 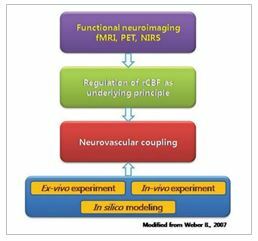 Neurovascular coupling forms the basis of functional MRI signals. Altered coupling may explain various disease conditions such as hypertension, Alzheimer disease, epilepsy and stroke. For understanding the behavior of neural circuit and coupled vascular activities, simultaneous recording of both systems is needed. Using two-photon microscope, we converge optical imaging (intrinsic optical signal, calcium signal and microvasculature activity), electrophysiological technique and biomolecular analysis. We are applying this system to understand the mechanism of cognitive processing and also neurological disorders which alter the neurovascular coupling. 1. Momentary level of slow default mode network activity is associated with distinct propagation and connectivity patterns in the anesthetized mouse cortex. J Neurophysiol 2017. 1. Kang M, Lee YB, Gohel B, Yoo K, Lee P, Chung J, Jeong Y. Momentary level of slow default mode network activity is associated with distinct propagation and connectivity patterns in the anesthetized mouse cortex. J Neurophysiol (E-pub) doi: 10.1152/jn.00163.2017. 2. Lee ES, Yoon JH, Choi JY, Adndika, F, Lee T, Jeong. Y. A Mouse Model of Subcortical Vascular Dementia Reflecting Degeneration of Cerebral White Matter and Microcirculation. J Cereb Blood Flow Metab. (E-pub) doi: 10.1177/0271678X17736963. 4. Lee H, Jung S, Lee P, Jeong Y. Altered intrinsic functional connectivity in the latent period of epileptogenesis in a temporal lobe epilepsy model. Exp Neurol. 2017 Jul 17. pii: S0014-4886(17)30181-4. doi: 10.1016/j.expneurol.2017.07.007. 8. 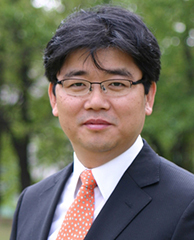 Yoon JH, Lee ES, Jeong Y. In vivo Imaging of the Cerebral Endothelial Glycocalyx in Mice. J Vasc Res 2017 April 01:54;59-67. Doi: 10.1159/000457799. 10. Park M, Jung H, Jeong Y, Jeong KH. Plasmonic Schirmer Strip for Human Tear-Based Gouty Arthritis Diagnosis Using Surface-Enhanced Raman Scattering. ACS Nano. 2017 Jan 24;11(1):438-443. doi: 10.1021/acsnano.6b06196. 11. Yoo K, Lee P, Chung MK, Sohn WS, Chung SJ, Na DL, Ju D, Jeong Y. Degree-based statistic and center persistency for brain connectivity analysis. Hum Brain Mapp. 2017 Jan;38(1):165-181. doi: 10.1002/hbm.23352.